Why Does Nursing Home Neglect Occur? - David R. Heil P.A. There is no excuse for nursing homes to fail in their obligations to meet a basic standard of care. Unfortunately, many Orlando area facilities are understaffed and overcrowded, and their staff members are overextended and simply unable to watch over all their patients while performing the other duties required of them. Medications can increase the risk of falls and fall-related injuries. Drugs that affect the central nervous system, such as sedatives and anti-anxiety drugs, are of particular concern. According to the Centers for Disease Control and Prevention (CDC), around 16 to 27% of nursing home falls are a result on environmental hazards. Many times neglect goes unreported. Each year, a typical nursing home with 100 beds reports 100 to 200 falls. In addition, frail, elderly people are particularly vulnerable to neglect and abuse precisely because they are frail and elderly and often don’t have the physical ability to report abuse or are too confused or humiliated to do so. 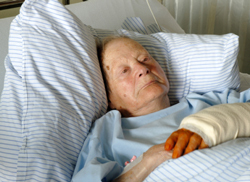 We are a compassionate advocate for nursing home neglect, help stop the abuse and neglect now. Please contact me to further discuss your rights.